All fed and watered! Lasagne for starters followed by grilled chicken and mashed potato. All off to the loo and then onto the coach. Final head counts … then final goodbyes to Sybil (wife of the child catcher in “Chitty Chitty Bang Bang”) who was probably very glad to see the back of the children, but more pertinently to Angelique who has been a super rep all week! Now watching “Finding Dory”. Franz is hoping to find the land of nod! Just come through the Mont Blanc tunnel so Franz is in France now. DVD player does not cope with the tunnel and has frozen again. MAB asking LC some very interesting geological questions about crevasses etc. Franz resorts to headphones and some Bruce Springsteen! Just stopped to change drivers. Sleeping children now all awake! Franz is Alfonso still awake. Franz is also still awake having never even been to sleep in the first place. 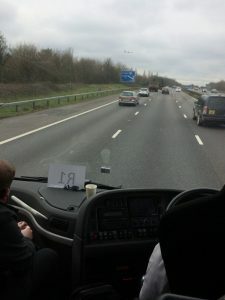 We are in a convoy of about 5 coaches – Franz and Granny Finnegan may remember a song about a convoy – 10 4 Rubber Duck. We are 355 kms south of Paris! 254 kms to Paris. 176 kms to Calais and we are ahead of schedule. Franz is awake, although to be fair the children have slept well. Happy birthday Franz! Franz does not feel like celebrating as we have an hour wait on the coach at Calais as we cannot get on an earlier ferry. We are taking the 0745 as planned. All safely through passport control, despite CA being given his passport and then leaving it on the coach. CF’s shorts and flip flops brought laughter from the border control officers as it is freezing in Calais. An hour wait has turned into an hour and a half and we should be on board and departed by now! 45 hungry, tired and bored children who don’t do waiting very well is not a great experience! Ship just arrived so hopefully it will be a quick turnarounds. This should keep EV quiet for the rest of the journey! Checking the children for chewing gum! MJ found some fakes nails – Franz is a bit worried as it was a boys bag! Children have all just sung Happy Birthday to Franz and NvH gave him a lovely card that says “it’s party time” – it will be when he has got rid of all the children. Staff have presented him with a bottle of Jamesons juice that he will enjoy! HR thinks I’m 71. I’m not in case anyone else thinks I am – I just feel 71. Just getting off the ferry now. The drivers are hoping to catch up some time, so we should be close to 10.30am Mrs Cowdery! Franz will update parents as we get closer. Staff all discussing the merits of the trip for the children. It is far more than just the skiing although that part is real fun and they make so much progress! It is about spending time away from home – many for the first time; it is about being independent and taking responsibility for yourself without your parents watching over you at all times. 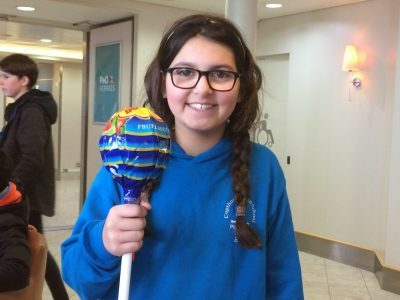 For some it is the fun of being able to buy rubbish in the shop (Franz apologises for the weird/ extravagant purchases – especially the super size chips chup lollies!). We have counted 45 children out and back every day, without losing or injuring anyone. 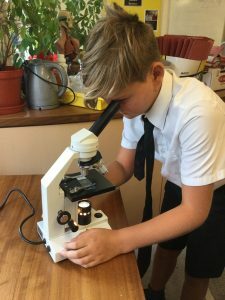 We rarely have had to raise our voices and the children have been a credit to their parents and the school – and yes, what goes on tour, stays on tour – so that is all you are going to get! Franz now taking bookings for 2019. Children’s EHIC cards are still in their ski jackets. Passports will be returned to children when we arrive back at school. If your child does not collect it, I will look after it. Drivers sat nav gives ETA at 1022. Please don’t be late. As much as Franz loves your little darlings, it is nearly time to give them back! I hope parents have had a lovely time without them! Please park sensibly and try to leave space for the coach to turn as last week! Franz sees he has a Bruce S fan in AA’s father and we have been on Thunder Road most of the night! I am afraid Franz is not prepared to keep WC for another week – I don’t think my ears would cope! Passports have all been returned to hand luggage so parents will need to search for them. Unspent pocket money also returned to children, so some are quite flush with cash! Turn them upside down and shake them and it should all come out! Franz suggests that parents don’t confuse the healthy sun tans for dirt, although in some cases this could be chocolate! A big thank you to our super Irish drivers (Paddy and Mick – Martyn and Simon) for looking after us so well and getting us home safely! On M25 now, ETA still 1022. Just passing Gatwick- plane flew over at a good time if you look at the photo carefully. 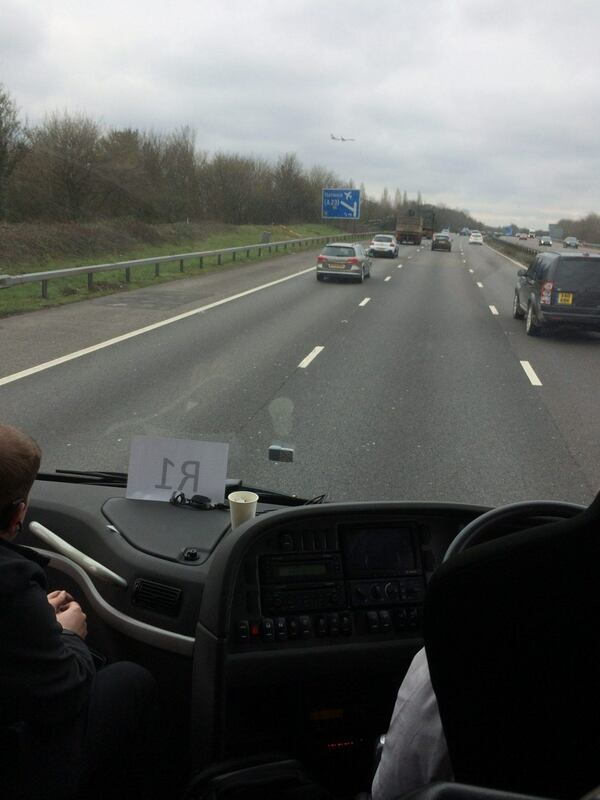 On A264 now! Final post from Franz – thank you to the children who have generally been excellently! Thank you to staff who have generally been excellent! Thank you to parents for trusting Franz with your children – 30+ school trips and we have never lost anyone yet! See you all next year – book early as places fill up quickly!! Safe journey! Loved reading your blog! Hope everyone has had a fab time & very much looking forward to seeing my boy tomorrow. Can’t wait to hear all the stories. Franz with all the snow it must feel like you are Driving Home From [sic] Christmas.. hopefully not on the Road to Hell! I suspect that even with the exceptional staff there was some Dancing in the Dark from the girls dorms but I trust that the staff had a Secret Garden to recover with Gluhwein! Happy 100th Birthday to …. Happy Birthday Mr Jones! Happy birthday Mr J! Thank you for the blog & looking after our kids. You sure you don’t want them for just one more week? Happy Birthday Mr Jones! 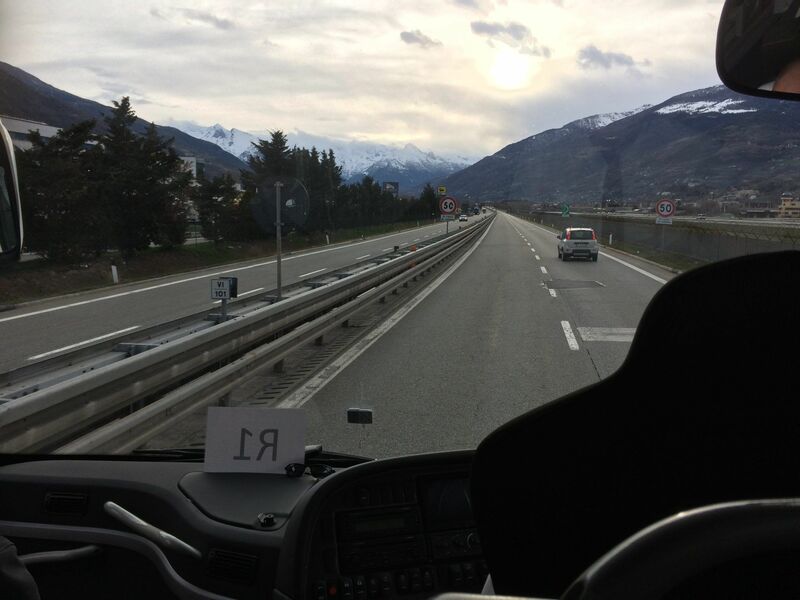 Happy Easter to all on board the tour bus! Thank you to all staff for giving up your time to give our children an amazing experience. Hope the children are sleeping despite the Chuppa Chups! Safe last hour. See you shortly! Happy birthday Mr J and a huge thank you for offering the kids this amazing experience, we have loved following the blogs and it sounds like it was a fantastic week. (Sybil sounded like quite a personality!) Our birthday present to you will be to come and take our young man off your hands 🙂 We think you’ve more than earned your 2 weeks R&R! Many thanks again. Paul – we did find the Secret Garden!